West Sacramento Bicyclist Injury – A West Sacramento bicyclist injury happened when a 6-year-old riding his bicycle to school was struck by an SUV on October 24 as he was crossing the street. The child was accompanied by his sister when the collision occurred at the intersection of Collins Street and Henshaw Road near Lake View Park. The Sacramento Police Department is investigating how the accident happened, and no charges have been placed against the driver as of the time of this report. The accident happened about 7:30 in the morning. The child, who was identified as Lucas Slape, was taken to a local hospital and, according to reports, was treated for a minor concussion and released. He was wearing a helmet at the time of the accident. The boy’s father said that he believed that the SUV driver must have been traveling at a slow speed and that the sun may have interfered with the driver’s ability to see. Although the location where the accident happened is near a city park, there are no crosswalks for pedestrians and cyclists. Area residents would like to see crosswalks and more signage since they consider this a dangerous area for pedestrians and bicycle riders since drivers passing through are often not cautious. Of particular concern is that the intersection at the entrance to a park, which is frequented by many people, needs crosswalks to avoid a West Sacramento bicyclist injury. It is more difficult for children under the age of 10 to judge the distance and speed of a motor vehicle than it is for an adult. Keeping children safe requires that both motorists and cyclists be instructed on safety procedures. Motorists must be made to realize that children are among the most vulnerable pedestrians and cyclists. Children are especially vulnerable when they are boarding or exiting a bus, near school grounds or when riding their bikes. 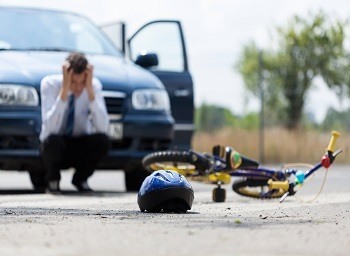 Learning how to look out for children when driving is important to avert a bicyclist injury. Older individuals accounted for 19 percent of all pedestrian fatalities and approximately 13 percent of injuries related to walking in 2013. Older cyclists also suffer more severe injuries when hit by a motor vehicle since they are more prone to health issues such as osteoporosis. This might lead to a serious injury such as a broken pelvis. Even a slight blow to the head can cause a subdural hematoma, requiring surgery. Being mindful of this and allowing more time for the individual to cross the road safely is one way motorists can prevent a pedestrian or bicyclist injury. I’m Ed Smith, a West Sacramento personal injury lawyer. Bicyclists and pedestrians can suffer serious injuries when they are in a collision with a motor vehicle. This can lead to high medical bills and other expenses. If a negligent driver caused your accident or that of your loved one, I would like to offer you free and friendly advice. Give me a call at (916) 921-6400 or through my toll-free number (800) 404-5400 if you are calling from outside the area code. If you prefer, you can use this online contact form to reach out to me. Million Dollar Forum was set up to recognize the top trial lawyers around the country who have obtained more than $1 million for a client through a case settlement or verdict. I belong to this group as a member of California. It has been my honor to have helped many West Sacramento residents for 36 years with obtaining fair compensation for their accident cases, including all types of car accidents, wrongful deaths and trauma such as brain injuries.